It’s almost time for the annual exhibition curated by the graduates of our programs in conjunction with MFIT. The exhibition, titled, Youthquake! 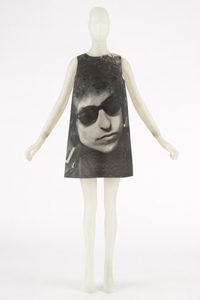 The 1960s Fashion Revolution, will open March 6. It will include more than thirty garments, accessories, and videos, and will feature works of fashion designers such as Yves Saint Laurent, André Courrèges, and Giorgio di Sant’Angelo. Another exciting exhibition will open in the large gallery downstairs, February 10th. Impact: 50 years of the CFDA was conceived by CFDA president Diane von Furstenberg, and curated by Patricia Mears and Fred Dennis. The exhibition will include approximately 100 garments and accessories designed by CFDA members, winners, and nominees in the past fifty years, among them Halston, Norman Norell, Pauline Trigère, Geoffrey Beene, Bill Blass, Rudi Gernreich, Bob Mackie, James Galanos, Diane von Furstenberg, Oscar de la Renta, Marc Jacobs, Donna Karan, Ralph Lauren, Calvin Klein, Tom Ford, Michael Kors, Tommy Hilfiger, Isabel Toledo, Rodarte, and Proenza Schouler. 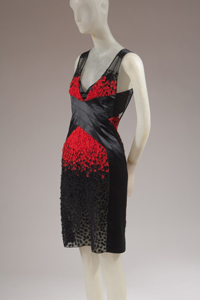 Narciso Rodriguez, embroidered silk dress worn by Michelle Obama on election night 2008, Spring 2009, USA, lent by Narciso Rodriguez. This entry was posted in Exhibition and tagged 1960s fashion, American Fashion, CFDA, MFIT, Youthquake. Bookmark the permalink.